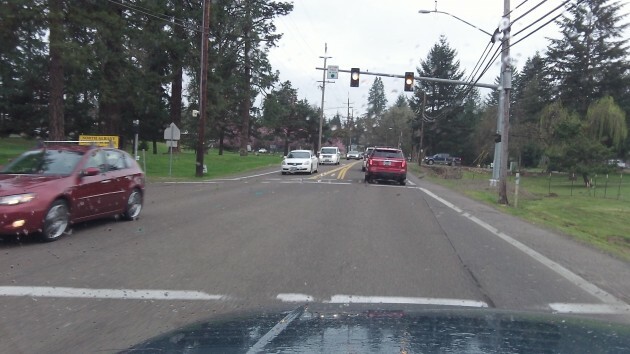 North Albany Road will get wider, and West Thornton Lake Road will be rerouted to this signal. If your daily commute takes you along North Albany Road, enjoy the drive while you can. Starting this spring and continuing through most of the summer, the route will be restricted and eventually blocked entirely so it can be rebuilt and widened. On Feb. 19 the Albany Public Works Department opened bids from six construction companies. K&E Excavating of Salem emerged as the apparent low bidder at $6,099,400, higher than the city’s estimate of just below $5.9 million. The city council may award the contract on March 11. The job calls for rebuilding and widening about 3,000 feet of the road from the railroad tracks north to just below the roundabout, including a new bridge across Thornton Lake. The new road will have a center turn lane and be raised a couple of feet to come within one foot of the expected level of a 100-year flood. Also included: Completion of a 30-inch water main between Hickory Street and the Broadway Reservoir on Gibson Hill, a distance of 3,750 feet. Traffic on the North Albany road averages 11,000 vehicles a day. When the road is closed from mid-June through early September, traffic will be detoured along Quarry Road and Spring Hill Drive. City officials plan to install a temporary roundabout at Quarry and Spring Hill, and at Highway 20, the plan is to restripe Spring Hill to create two left-turn lanes and adjust the signal to handle the extra flow. Abany has just notified North Albany residents of the construction schedule. It starts with a public open house to explain the project on March 12, from 4 to 7 at North Albany Middle School. Utility and road construction will start in mid-March with various lane closures and flaggers. From June 12 through Sept. 4 the road will be closed entirely. It’s expected to reopen on Sept. 5, but minor work and landscaping will continue for a while after that.